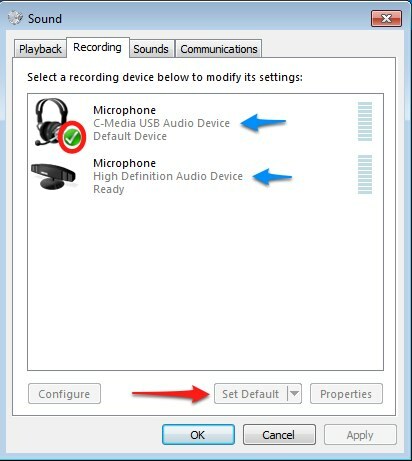 This guide will show you how set the default recording device and adjust the input volume to achieve the best sound when using any microphone (internal or external) with the Panopto Recorder in Windows 7. 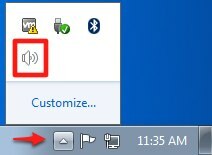 If you don’t see the “speaker” icon, click the arrow to the left of the task-bar icons, You should find the “speaker” icon hiding out in there. Select the device you would like to use by clicking on it. If not already the default the “Set Default” button will un-grey itself. Click that and you’ll see the green check mark switch to the device you selected. There are a lot of different audio chipsets out there so you might see different device names. SoundMax HD, C-Media, IDT Audio, Texas Instruments, AC’97 Audio, Creative Labs, Conexant, Realtek, SigmaTel, Cirrus Logic… these are just a few names you might see. All of which will work with Windows and great with the Panopto Recorder. Now that your default recording device has been selected and set. Let’s adjust the levels to achieve optium quality in the Recorder. Click on your default device to select it, then click the “Properties” button. 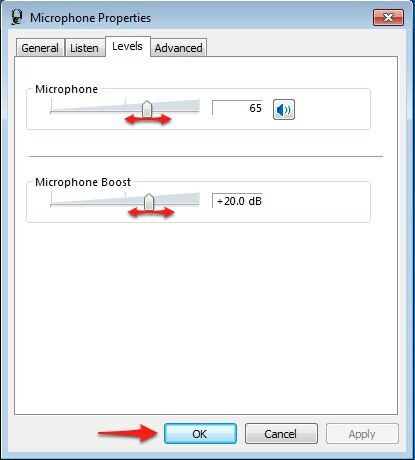 Using the controls you can adjust the input level of the microphone. Click “Apply” when you’ve set them so you can check how they look on the meter in the Recorder. This process can be tricky due to different hardware names and devices. If you need any assistance please do not hesitate to contact us at bluecast@creighton.edu and we’ll help get your audio settings configured correctly.